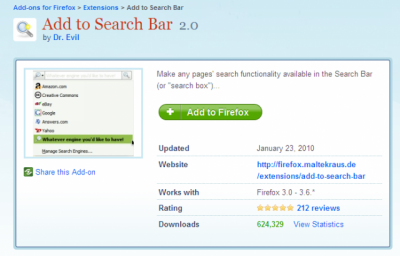 At the top right of the Firefox window, you'll find a search box. Click on the icon to the left of this and you can choose a specific search engine or service to use when looking things up on the internet. This is really convenient if you want to search through the pages of a particular website, such as Amazon, Wikipedia and so on. 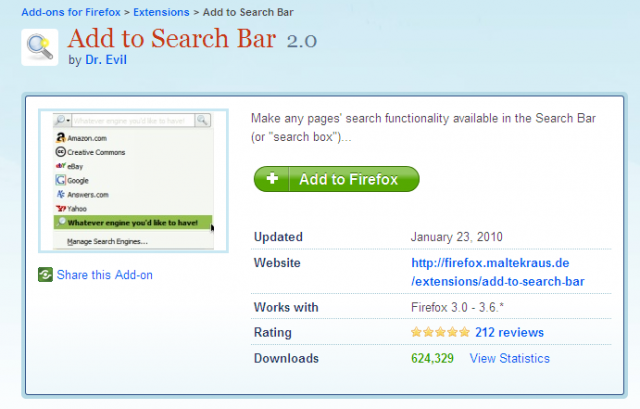 In this article we'll explain how you can add a search service you use often to Firefox. To help explain, we'll use the example of Nihongo de Care Navi, a website run by us here at the Japan Foundation, Japanese Language Institute in Kansai. On this site there is a search form you can use to look up the meaning of a Japanese word or phrase you don't know, plus how to use it. In this article we want to look at a way to make use of this function whenever you want - without directly having to access the website itself - via the browser's search bar. First, let's install the add-on. We'll use an add-on called Add to Search Bar. Access the linked page (shown below) using Firefox, then click on the green button marked 'Add to Firefox'. Install as directed in the on-screen instructions, then restart the browser. Next, access the search page of the search service you want to add to the browser. 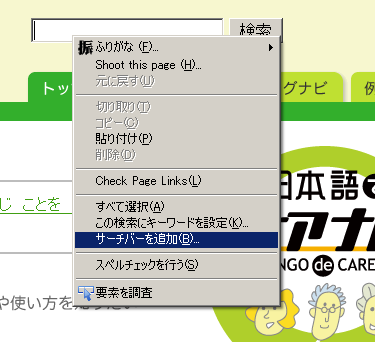 For our example, this is on the top page of Nihongo de Care Navi. 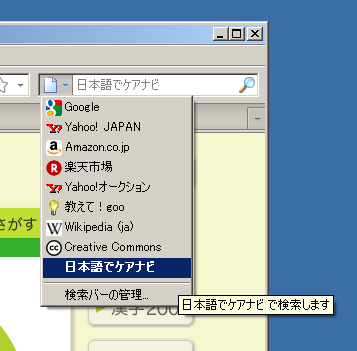 Right-click on the search input box, then choose 'サーチバーを追加 (Add to search bar)' from the menu shown. A confirmation dialogue will appear. Here, if the service name is very long, you can shorten it. Next, press 'OK'. The search service is now entered. It will appear added to the bottom of the list on the search bar. Easy, wasn't it? Why not go ahead and enhance your search bar with the search services you use most often!